Festivities and new product launches always go hand in hand. The Diwali gone by brought on the right occasion for the launch of a limited edition Oreo – the new Oreo Roast Almond Crème. The sandwich cookie that plays around sibling mischief in its television commercials, chose to go with the same concept again but this time without celebrity endorser Ranbir Kapoor and his teenage sister. The TVC conceptualized by Interface Communications captures the story of a brother-sister duo who are out shopping for Diwali lanterns, but end up bonding over a pack of the new roast almond flavour. The TVC is set at a shop where you can see the brother seated on a stool while his sister is busy checking out the display. The sister is the elder of the two and makes sure to take her younger brother’s opinion for every lantern she likes, but all he wishes is to go home. Finding an Oreo pack in her bag, he begins to indulge himself in it, and responds positively to all her questions. She finds out the reason for his sudden happiness and joins him with a bite of the new Oreo. The social media savvy cookie extended the launch during Diwali with an interesting quiz around crackers. Like a personality quiz, it asked you questions about your preferences during the festival, and found out the type of ‘cracker’ you are! 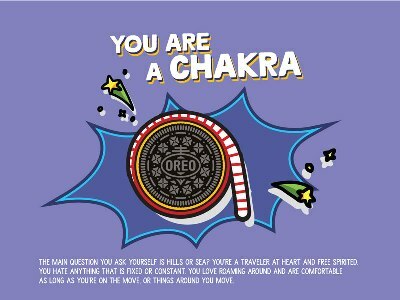 I was identified as a ‘chakra’, a free-spirited traveller at heart who hates anything that is fixed or constant. This is so nearly true that I suggest you too find out the type of cracker you are. 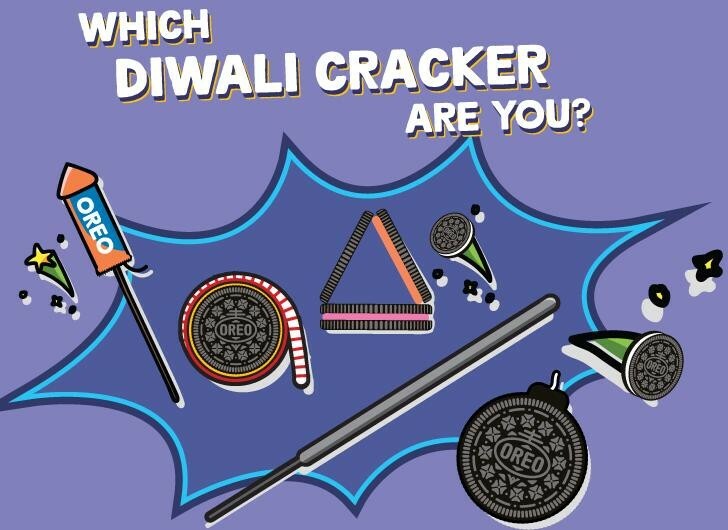 The Diwali cracker quiz is hosted on an Oreo website that needs you to answer five questions made up of five choices each. Questions relate to what’s the best part about Diwali, your favourite Diwali decoration, your favourite Diwali sweet, etc. I only wished the quiz let me choose multiple options, I love most of the sweets and couldn’t bring myself to select just one. Extroverts are ‘Sutli bombs’; the center of attention at any party who always make themselves heard everywhere. ‘Flower pots’ or ‘anars’ are the ones who never get into a fight but kill it with their one liners. The ‘Sparklers’ are the reserved ones but they are the craziest when around their set of friends. The unstoppable ones have been identified as ‘Rockets’; they can take on anything they set their mind to. 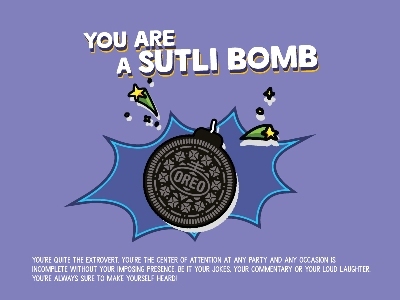 The quiz also asks you for your favourite Oreo flavour amongst the five flavours. Interestingly, the cracker visuals have been designed with Oreo. You can share the type of cracker you are on Facebook or Twitter. Oreo never fails to amaze me with its bright and cheerful visuals. The creative blend of Diwali crackers being visually imagined with the cookie is a smart way to integrate the brand this Diwali. The cookie brand has taken away the limelight with its witty visuals around crackers. Besides, associating crackers to personality types has made for an interesting personality quiz, which is otherwise ignored by social media users. The campaign brings across the message of a fun and safe Diwali too through the virtual medium. ‘Which Diwali cracker are you’ also ensures the brand makes a playful connect with its fans this Diwali, instead of the regular Diwali campaigns. This year the brand is on a global mission to instill ‘playfulness’ into its consumers’ lives and has been extensively getting fans to ‘Play with Oreo’ in creative ways. The cracker quiz rightly designed around Diwali aligns well with its global mission.